_PROMISE: "Each priest who worthily offers the Holy Sacrifice of the Mass for 30 consecutive days and, in addition, makes the Stations of the Cross daily, will receive for himself: and another soul selected by him, the assurance of eternal salvation." _PROMISE: "Likewise, each individual who will receive Holy Communion worthily for 30 consecutive days, and will recite one Our Father and Hail Mary for the welfare of the Holy Catholic Church, will receive for himself and one other soul selected by him, the assurance of eternal salvation." The Divine Lord should be received in Holy Communion in the most worthy manner possible, and always in the State of Grace. 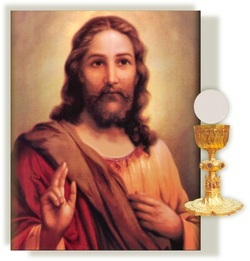 Before Holy Communion, ask Jesus, "Lord, cleanse my soul of all wickedness that it may be worthy of Thy Grace. Lord, bath me in Thy Divine Blood". Despite the fact that we have a free choice of the second person for whose salvation we may pray, it may be best, at your discretion, to concede this free choice to God, saying something like, "Dear Lord, I will pray, and leave the choice of the second person's soul entirely up to Thee. Please grant us both the grace for which I implore Thee." This devotion may be repeated again and again, indefinitely, during the span of one's lifetime. The thirty-day Novena must be said for thirty consecutive days. If, for any reason, one day is missed, the novena must be restarted at day one. During the course of this novena, Satan, the eternal foe of our salvation, will by many means attempt to dissuade us from this devotion for the intention of our salvation; he will attempt to weaken our will and to induce anxiety, so as even temporarily to restrain us in our effort or to cause us doubt. He will particularly provoke us to anger, impatience, and ill will toward our neighbors. In such trying moments, it will take sheer will power to say to him, "Begone Satan!" Ask Jesus for the strength of endurance. _"From Poland will come the spark that will ignite the whole world and prepare it for My Final Coming." "Write, secretary of My Mercy, speak of My Great Mercy, for the dreadful day of My Justice is slowly approaching." _"Tell the world about My Mercy and My Love. I am consumed with a desire to pour out My Mercy on human souls. O, how they hurt Me when they refuse My Mercy." _"I cannot punish even the most hardened sinner, if he appeals to My Mercy. He is immediately granted pardon through My incomprehensible and unfathomable Mercy." _"My compassionate and loving Heart is inflamed with an intense longing for the salvation of souls. When they turn to Me, I can hardly restrain My joy, and I rush forth to meet them." _"My Heart finds joy in forgiveness. I have no greater desire nor happiness than to be able to forgive."